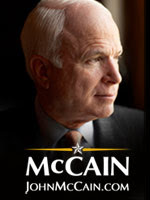 Sen. McCain gave a speech tonight that is probably the best of his political career. Instead of talking about what is wrong with America it was about how much he loved America. He spoke of how he found the right partner to shake up Washington. He spoke of unity. He promised Independents and Democrats in is administration. He took the mantel of change right out of the hands of Sen. Barak Hussien Obama. He spoke on issues- regardless of what the Democrats will say. He spoke very personally of his time in Vietnam. "We are Americans, We Never Give Up, We Never Hide for History." As the crowd went wild, I personally started flashing back to hearing about "the Shining City on the Hill." It was outstanding. It will win votes. I will post a video of the speech as soon as it is available. Michelle Malkin provided live blogging during the speech. Her thoughts are here.